PST Sport offer a complete ‘turnkey’ solution to our clients and each project is tailored to your individual requirements. By offering a comprehensive service we can guide you through every step of the process from design & planning, drainage & groundworks, right through to installation and maintenance. The installation of an artificial grass pitch is only part of the story. At PST Sport we demonstrate in-house excellence in civil engineering and provide expert advice and assistance on what is the best choice for you as well as ensuring that you meet all necessary performance and quality standards. Our extremely committed in-house team have the experience and technical ability to successfully deliver every element of your project. We will work with you to choose the most suitable artificial grass surface for your project based on the type of sport played and the number of hours your all weather pitch will be in use, all while ensuring that you meet any budgetary constraints. PST Sport have a proven track record in all areas of artificial grass installation and have also provided additional services to clients such as running tracks and pavilions. 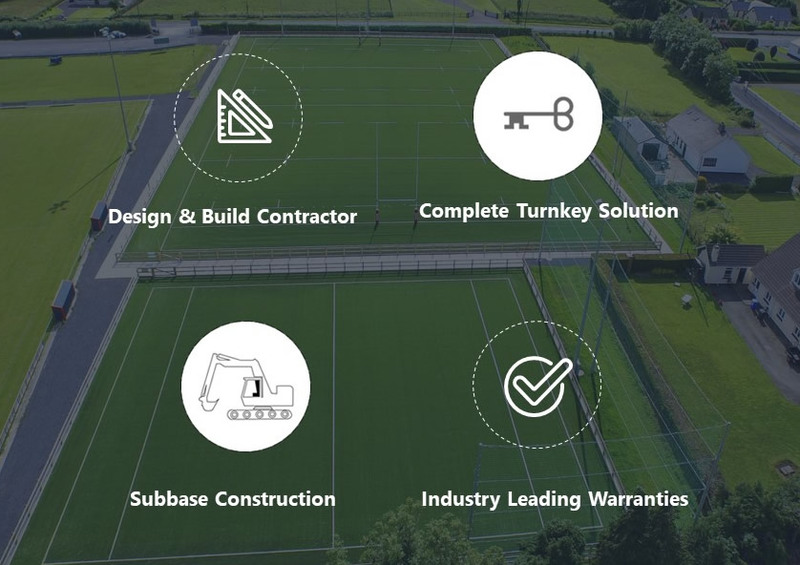 Whether you require a resurfacing of your existing pitch or if you want a full turnkey installation then PST Sport is the company for you. “From the outset, it was obvious that PST Sport held the in-house expertise and technical ability to successfully deliver this element of our project. The nature of the site presented some unique challenges. This included a “live” stream which traversed the pitch, overhead ESB lines that had to be diverted prior to construction and the rather poor existing ground conditions.